Search your library for up to two creature cards and reveal them. Put one into your hand and the other into your graveyard. Then shuffle your library. Easiest way to get something on grave is with Scion of the Ur-Dragon . Of course there are cards like Entomb or Jarad's Orders too, to cut the steps needed, but it might be hard to find room for those cards if the grave abuse is not the main thing of your deck. Commander is a slow format.. at least usually, so the need for the ramp is often compensated by Ur-Dragon's Eminence ability and with ramp sorcery spells. Manafixing might be the real issue though. For extra protection cards like Propaganda and Ghostly Prison are good to buy some time to gather your resources and army. Instead of Final Parting, I think Jarad's Orders would be a better choice. It does the same thing but it costs one less mana. Just giving you more room for casting. Looks great! Cards like Aura Shards and Return to Dust are edh allstars (I'm guessing one of the cards you skipped was Vampiric Tutor ? That one's pretty good too), and there's a bunch of gameplan-specific cards like Buried Alive and Dread Return that will work perfectly with Karador, Ghost Chieftain . Some other staples you might want to add are Eternal Witness and Sol Ring . First thing you should probably change is playing 2x Makeshift Mannequin ... I know you're into playing banned cards and everything, but this format has RULES! The consistent options are great, since they allow you flexibility to find any answer, support synergies, and aren't going to whiff. The inconsistent options don't have the same upsides. The main reason you'd want to play them is to grind out value, so I think Perpetual Timepiece and Nyx Weaver could work (although I've been looking for an excuse to try Grindclock because I'd imagine it can take over a game if let's unintended for a few turns). Corpse Connoisseur is only useful if it's already in the graveyard, and Entomb might be a better option. Extractor Demon has the same issue where it's overcosted for a Thought Scour effect. 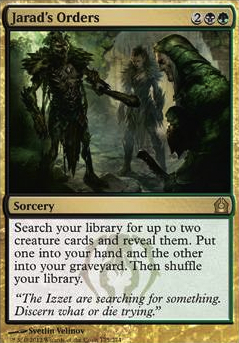 Overall, since you only have three or so creatures that benefit from being cheated out from the graveyard, cards like Satyr Wayfinder might end up hitting things like Harrow , Buried Alive , etc. too often. 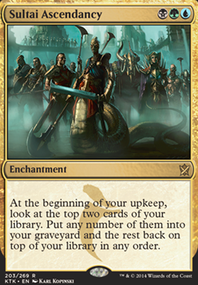 This means you're probably going to have to play more self-mill type cards to justify cards like Ramunap Excavator . Sylvan Ranger seems strictly worse than both Sakura-Tribe Elder (puts the land into play and puts himself in the graveyard to reduce Karador cost) and Rampant Growth . There seem to be a couple cards like this that are meant to provide some enter-the-battlefield trigger and then get sacrificed for value, but I only see Viscera Seer , Cartel Aristocrat , and Bloodthrone Vampire . That means most of the time you play cards like Elvish Visionary , it'll just be a 1/1 on the battlefield. Viscera Seer is fantastic, but the other two outlets don't get you much value anyway, which makes cards like Yavimaya Elder more valuable. Looking into effects like Qasali Pridemage , Selfless Spirit , and maybe even Spore Frog is probably where you want to go, since they are situationally fantastic, can put themselves in the graveyard to cast karador, and are much stronger options to cast with Karador later in the game. They can subtly win you games sometimes. Maybe looking into things like Skullclamp could help if you want extra sac outlets, but you'd probably want ~10-15 cards that make 1/1's to justify it (not entirely sure though). It's wildly powerful though, especially if you can recur 1/1's with Karador. Finally, figuring out how you want to use your toolbox cards ahead of time help. Right now, there are a couple good lines for Buried Alive , such as Dread Return + Sheoldred, Whispering One , but what happens if you don't have three creatures available? Then you want Unburial Rites in your deck so you can pay 3W next turn. Some final things to hammer out: 1. What's the plan for early game? Is it playing sac outlets then creatures with ETB triggers for extra value? It is playing utility creatures like Qasali Pridemage to develop a relevant board and solid recur value later in the game? Is it to ramp as quickly as possible into huge threats? Is it getting creatures into the graveyard ASAP with Grim Flayer or Entomb so you can Reanimate something huge on turn three? It's not bad to dip into each method, but you can have the best synergies if you heavily commit to one strategy, otherwise you might end up with great curve like Reanimate , Bloodthrone Vampire , and Ramunap Excavator , but no real value. 2. What's the win condition? I'd expect reanimating huge things out providing too much value with Karador, but even the best reanimation target Sheoldred, Whispering One isn't going to close out a game. The other targets like Soul of the Harvest and Harvester of Souls are great value, but bashing with a 6/6 can only go so far. If you're going more the reanimation route, perhaps dreaming bigger like It That Betrays could help. If you play these big boys, playing Ashnod's Altar could be fun, plus I think it's got a bunch of infinite combos. Sadly, a lot of the best options like Elesh Norn, Grand Cenobite are ~10-20 bucks. 3. My personal strategy would be to play a bunch of cheap value creatures like Selfless Spirit , ramp like Sol Ring and Sakura-Tribe Elder , the best graveyard stashers like Entomb and some self-mill cards (but only ones that can win me the game if left unattended, like Underrealm Lich ), 3-5 board wipes (you can always recur your threats) and the classic interaction package ( Swords to Plowshares , etc. 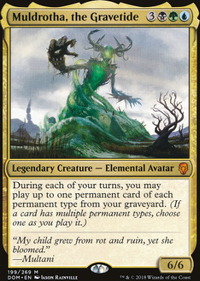 ), and probably 7-10 or so curve-topping creatures that can end games for you (from Grave Titan to It That Betrays ). The deck looks great, it's gonna be scary in no time! I think you want to go in on the self-mill, make zombies theme, so you should trim the fat on things that don't fit what you want to do. I like the dredge cards, and I like the cards that put cards from the top of your library into your graveyard to trigger Sidisi, Brood Tyrant . Cut Prime Speaker Vannifar , Razaketh, the Foulblooded , Sidisi, Undead Vizier , Tasigur, the Golden Fang , Taigam, Sidisi's Hand , The Scarab God . I'm not big on counters, so I'd probably leave out Frilled Mystic . Liliana of the Veil and Liliana Vess don't really fit the theme. Switch Wonder for Filth , especially since you're running Urborg. I think most of your tutors could go, so Diabolic Tutor and even Jarad's Orders could go. I'm not sure Jarad, Golgari Lich Lord fits very well, other than he's a zombie. If you see yourself sacrificing lots of zombies to him, then keep him. You should run Rooftop Storm , and consider Soulquake . Take out Shriekmaw and put in Fleshbag Marauder (fits the tribe), and don't forget that Gray Merchant of Asphodel is a zombie, too, and you're running a high black pip count; he'll pay off. I'm wavering on Meren and Muldrotha; I see why they are here, and how the will be useful...especially Muldrotha. If you had to choose one, I'd keep Muldrotha. Villainous Wealth is fun, but is it what you want this deck to do? I hope that helps you get started! Nomingia I would say run 4 birds and maybe even 2-3 other 1-cost mana creatures, and then go down a land or two. Birds do have a bit of a price tag, so other options are Arbor Elf , Llanowar Elves , Elvish Mystic and Elves of Deep Shadow . My advice is that since this is a casual deck, don't spend too much money on it - that way if you ever decide to get into a specific format like modern, standard or commander, you'll have more money left to spend on the cards that are essential for that (while in casual decks, pretty much anything goes). There's no actual need to ever get into a "real" format, but it does make it easier to find people to play with who have similar power-level decks. Mastermind's Acquisition lets you get any card in your deck or any card in your sideboard (outside the game means sideboard) and is not limited to just creatures so it gives you a few more options. 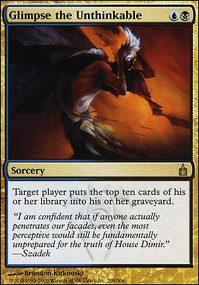 Diabolic Tutor is the cheapest (in terms of money) card I know which can find you whatever you need. Green Sun's Zenith is similar to Chord of Calling , but it is also pretty expensive so just putting it here for reference. Eldritch Evolution is a slightly cheaper way to get a creature of your choice onto the battlefield directly, and although you do need to sacrifice a creature, the effect is still very powerful and can sometimes be faster than Chord since it requires less mana. If you want a card every game and are happy to draw multiples, play 4 (and maybe also play other cards with the same effect if they exist). If you want a card every game but you don't usually want more than 1 in a game, play 3. Playing two of a card is weird, usually I only do this if I only have two spare slots for cards left in the deck and just fill those up with something else or if I can't afford 3 of a card, but this all comes down to judgement too and there might be other reasons to play two. If you never ever want more than 1 of a card in a game (maybe because the effect is a lot worse the second time you cast it, or because you don't intend to actually draw it but you are looking to "tutor" it out with cards like the ones I've mentioned above) then just play 1 of a card. Final Parting is a fantastic tutor, akin to Jarad's Orders , except with greater selection! Creakwood Liege is a good way to continue making tokens to sacrifice, while also buffing your insectile army. Empty the Graves allows you to still shamble together an army after a boardwipe, while a tried and true aristocrat such as Yahenni, Undying Partisan makes for a fantastic, indestructible sac outlet. Conjurer's Closet gives you a way to keep producing a swarm of golgari insects, but also gives you some reuses of your other etb triggers. 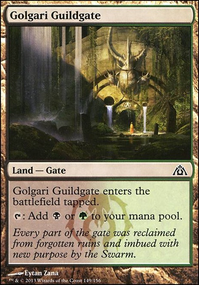 Other solid cards you may enjoy include Viscera Seer , Eternal Witness , and Birthing Pod . Final Parting is just like Jarad's Orders except it can also let you tutor Reanimate to hand and the creature you want to your graveyard. 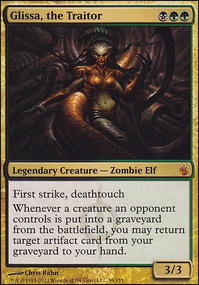 Gravecrawler is a great creature that keeps coming back with as long as another zombie's remains remain. Laboratory Maniac is a nice alternate win condition, since Sidisi will be milling a good chunk of your deck already! Coat of Arms is another nice way to turn your undead horde into a (more) terrifying army, especially when the army abruptly arises from cards you've already included such as Doom Whisperer and Mesmeric Orb .